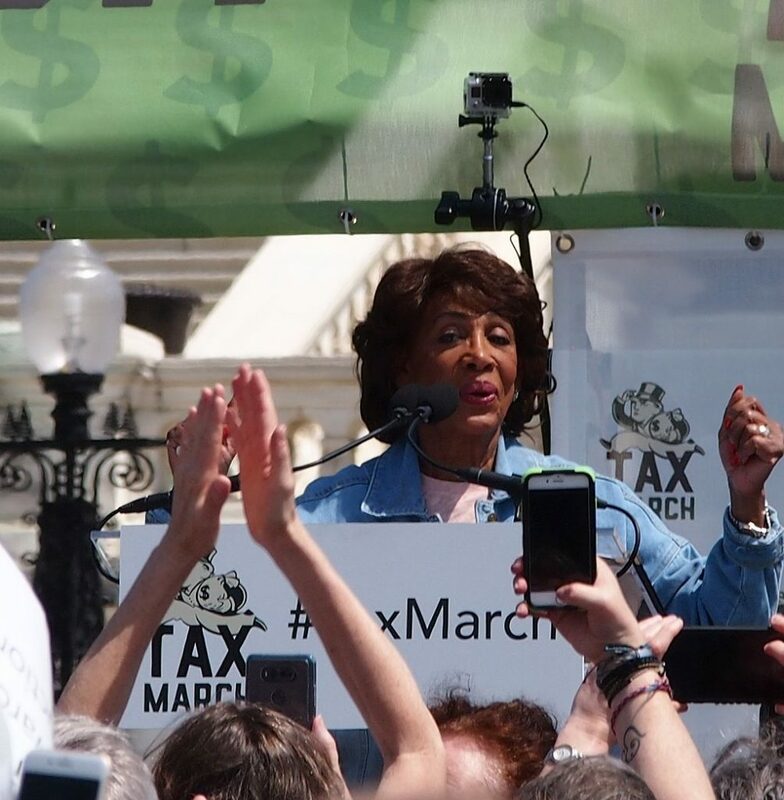 Inspired by a comment made by bfitzinAR and the encouragement of WYGalinCA, today’s post is all about Maxine Waters (CA-43), one of the leaders of the ReSisterhood. She’s 79 today, and as a self-described “strong black woman,” she’s been controversial, contentious, courageous, and a clarion of truth. This article, How Maxine Waters became ‘Auntie Maxine’ in the age of Trump gives a nice overview of her background without shying away from her more controversial moments. But really, I can’t say anything that Rep. Waters couldn’t say better, so today let’s just listen and learn. As mentioned in the LA Times article above, “In 1994, she was gaveled off the House floor when she refused to stop loudly criticizing a Republican member she felt had badgered a female witness during a hearing.” Some things never change for the women of Congress; nevertheless, she persisted. “Deal with it!” Just watch the first 48 seconds while Rep. Waters responds to a question about what she thinks of criticism of liberal candidates by Black Lives Matters activists (after that, Roger Stone responds to a question, and it’s better for one’s blood pressure to skip it). At the 2016 Democratic Convention; this is bittersweet, of course, but she nails the issues that were important then and even more important now. Don’t forget, Trump offered to pay legal fees for those who attacked protesters at his rallies. Will he be making that same offer now? Trump claimed he didn’t know D. Duke, but Duke said white supremacist rally was done to fulfill Trump’s promises. Do you know him now,Trump? And now for your Tuesday Basset…I knew there was a reason I liked George Clooney! Good morning and thank you DoReMI! Still waking up, and will be back later. I loved the mini thread that you had tweeted on how your daughter going to a different school opened your eyes. It was heart-affirming and inspiring. Good morning, Pond Dwellers and thanks for the double duty as always, DoReMi. It’s always so peaceful here, away from our resident spammer. I. Love. Auntie. I share cco’s feelings for her. You should post your diary at the squirrel. I think it’d go over well. Perhaps they could use it for the midday diary. Maybe it’s just wishful thinking on my part, but I think the Orange Shitgibbon is going downhill. He’s lashing out more. Tweeting and retweeting racist stuff. If this can continue, now that congress is home and can see him for what he is, maybe a 25th amendment can happen. A girl can dream, right? 58 degrees right now. High of 85. Nice back to back days. Stay strong everyone. Thanks…I don’t generally like to get that autobiographical on the Interwebz, but WW have to do better. Our silence cost lives, so I hoped to illustrate that while it’s understandable, it’s also unacceptable. I’m headed out to the SoS to get my license and registration renewed, so I doubt I’ll be back in time for Squirrel midday. I’ll check into it when I get back though. Wish me luck; I have to take the test this time (only 10 questions), and I always overthink them. I’ve never even had a ticket, but the damn test still rattles me! I understand. Here in Cali, if you haven’t had any accidents, it’s just a renewal every five years. I haven’t taken a test for years. Good luck. And after all that, I just had to do the eye test! Ih well, at least I’m set for the next four years. [[[WYgalinCali}}} – she is great, isn’t she? 79 but she’s gonna hang on – and fight on – as long as we need her to. Bless her. pvl45 is definitely going downhill fast but I really hope all 3 parts of the R party stay at each other’s throats until we can take back Congress. If any of the 3 manage to actually gain the upper hand, we’re the ones who will suffer. The difference between Nazi-occupied France, Cromwellian England, or “Pottersville” USA is only in who is ruling and which demographic is targeted first. Right now we’re more like in Vichy France – nothing good about it but it certainly could be worse because the actual fighting was around us and not involving us.